Choose the right competitive swimwear to give you an advantage. Swimming is not only great for your health, but it can be an incredible challenge for many. Joining a high school swim team can be a highly rewarding experience that can be made even better with the use of the best competitive swimwear brands. In fact, some of the latest designs in Speedo swim team suits feature thin straps, which offer incredible comfort for swimmers, while maintaining range of motion. 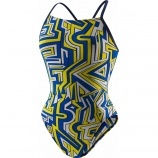 Choosing these competitive swimsuits can offer many advantages. When it comes to competitive swimwear, Speedo takes pride in offering a variety of styles to make sure every swimmer can find the perfect suit for comfort and support. Even if you know you want a thin strapped swimsuit, you will still have several styles from which you can choose. Several of their current styles include the Mind over Cross Back PowerPLUS swimsuit, the Got You Cross Back PowerFlex Eco swimsuit and the Conquers All Touch Back Endurance+ swimsuit. Each of these suits showcases the latest in Speedo technology and offers an incredible fit and comfort level that can’t be found with some of the other top competitive swimwear brands. In addition to choosing from the variety of styles available, you will find there are a number of colors and prints to select as well. For instance, the Mind over Cross Back features a fun lined pattern available in five colors and color combinations, while the Got You Cross Back offers a design that features horizontal lines and is available in five colors. Finally, the Conquers All Touch Back swimsuit was created with a maze-style design available in four colors and color combinations. Choosing the right competitive swimwear is all part of performing your best in the water. Whether you’re just getting started with your high school team or you swim on a higher level, there are many competitive swimwear brands to choose from. However, not many of them do as well as Speedo swim team suits. These suits feature all the comfort and support swimmers need without restricting your movement. If you’re looking for the best competitive swimwear in Dallas, contact us. D & J Sports carries a full line of the best competitive swimwear brands for the best results.